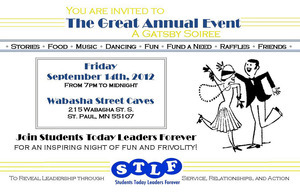 It's time to get a wiggle on and sign up for STLF's Great AnnualEvent: A Gatsby Soiree! Slip into your glad rags and put on the ritz at the Wabasha Street Caves September 14 in St. Paul! 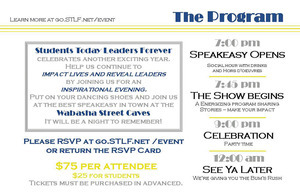 Come enjoy some giggle water and grub while celebrating some of STLF's most inspiring leaders. It's an evening of great friends, good food, entertainment and energy in support ofSTLF's mission to reveal leadership through service, relationships, and action. Tickets are $75 with a reduced rate of $25 for students, teachers, and folks doing a year (or more) of service. Proceeds go directly to STLF's financial aid fund. Register on Friday, September 7 for a special price of $50! Head to go.stlf.net/event to sign up! Whether you're on the lam or a Mrs. Grundy, we hope to see you at STLF's Great Annual Event: A Gatsby Soiree!